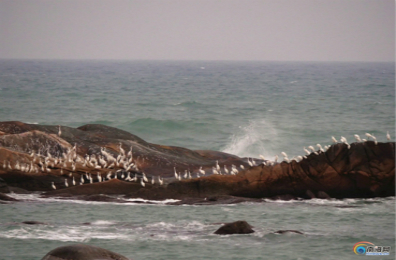 This year, 21,297 aquatic birds of 65 species are spending winter in Hainan, according to a survey released on Feb 1. Data showed that 2,198 birds of 10 species belonged to the family anatidae, 74 birds of four species belonged to the corncrake family, 12,114 birds of 33 species belonged to the wader family, 1,531 birds of five species belonged to the gull family, and 5,380 birds of 13 species belonged to the heron family. Four groups have settled in a bird observation area, including one group in the northern line, one in the eastern line and two in the western line. Professional birdwatchers acted as group leaders, and 46 primary habitats for aquatic birds throughout 11 regions in Hainan, including Haikou, Wanning, and Sanya, have been monitored in an attempt to pinpoint the number and species of the birds. Surveys of winter aquatic birds have been going on in Hainan since 2003, making it the most long-lasting and influential provincial bird-monitoring activity. Nearly 40 birdwatchers and workers from the reserves participated in observation work under the guidance of the local wildlife protection department.